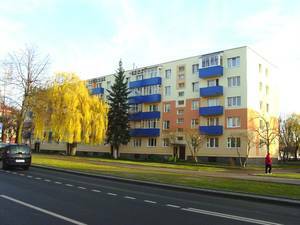 The Housing Department of Grodno Oblast Executive Committee (administration of the Province Grodno) is responsible for the majority of the existing housing stock in the entire Province of Grodno. The Executive Committee selected the city of Lida as a Target Area within the project Urb.Energy. In Lida an integrated development con-cept will be developed that covers the entire area of the core city. As a preparatory step, three sample buildings (that are representative for the housing stock in Lida) will be analysed and refurbished. 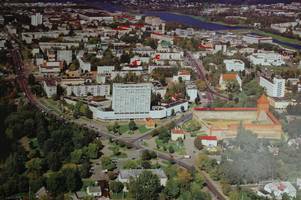 Lida is the fourteenth largest city in Belarus, situated 110km east of Grodno. The city of Lida is a very old city with roots back to the 13th century. However, the city suffered serious damages during WWII and nowadays the city is predominately characterized by multi-apartment buildings from the soviet era. The major part of the Target Area is connected to the central heating system. Recently, large renovation activities has been carried out in order to upgrade the public spaces in the city centre and to improve the general conditions of the buildings. However, still a major part of the housing stock in the city lacks sufficient insulation. Regarding the district heating system there is an urgent need to install individual meters as well as to modernize generation plants and networks. Currently the major energy resource is gas and local energy sources (like fire wood, peat and sawdust). There is the intention to increase the share of cogeneration (3-4% at the moment) but currently there are no special financial programmes available to support the extension. At the present time there are no renewable energy sources in use in Lida. This is due in particular to the lack of ex-periences and certain sceptic-cism about the efficiency of renewable sources. The buildings 43 Sovetskaya St (type1), 35 Tavlaya St. (type2) and 24 Mitskevicha St. (type3) are typical buildings in Lida. The type1 is a brick building, meanwhile type 2 and 3 are concrete slab buildings. 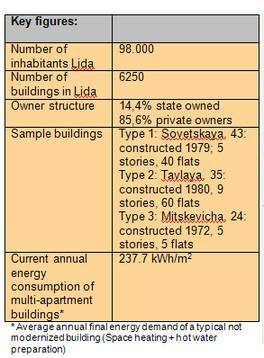 Together there are 535 buildings in Lida of the same typology. Currently they have a very poor overall energy per-formance, insufficient internal heating systems and they are not embedded into an overall energy concept of the surrounding neighbourhood. For the sample buildings the project partner develops and implements a comprehensive refurbishment concept. The so gained experiences are an important part of the awareness rising activities to promote the enhancement of energy efficiency of the existing building stock. Parallel the Executive Committee elaborates – supported by an consultant – an integrated urban develop-ment concept for the city of Lida that consider in an integrated way approaches to refurbish the housing stock, to promote the use of local and renewable energy resources as well as the modernization of the district heat supply system. The concept addresses as well the possibilities to activate financial support for the modernization and to enhance the living environment around the buildings.